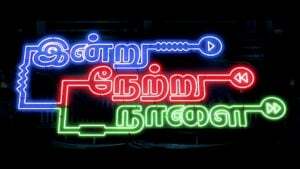 #‎IndruNetruNaalai‬ – An out of the box entertainer with right amount of humour and thrills. Being a film based on ‘Time Travel’, the director succeeds in keeping the script so simple & understandable for everyone with good twists and turns. The director and team should also be appreciated for understanding what exactly the script demands and spending wisely for its low budget, though not compromising on mandatory things. Except 1 or 2 uninteresting scenes, the whole film is fresh and engaging. The theater bursts out in laughter for every other comedy one-liners; Karunakaran has done a great job. The only minus was the love portion; if it had some more detailing and if there was a better chemistry between the lead pair, the twist in the pre-climax portion which pushes the hero to get into the time machine again would have been much more impacting. Also, the casting for the villain role looked too odd. Except 1 song, others were too average in Aadhi’s music; however, the background score was one of the biggest plus points of the film. Overall, an interesting Sci-Fi comedy thriller. Not to be missed! Happy for the hat-trick success of actor ‪#‎Vishnu‬, who has been struggling for a long time to position himself in the industry!